Music in the Air is a community event sponsored by the Pass Christian Chamber of Commerce. 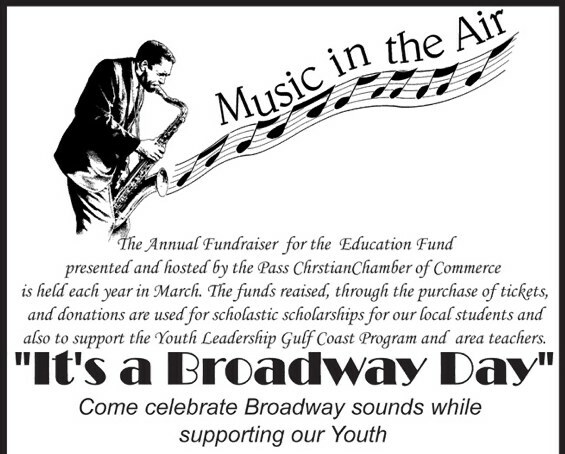 Music in the Air annually provides interested community members to share in the group effort to support Pass Christian’s local youth and to partake in a significant role in the future of the "Pass." Music in the Air is a celebration and effort to support Pass Christian’s local talented youth. Funds raised are used to provide music award student scholarships. Music in the Air also supports the Youth Leadership Gulf Coast, Pass Christian Unit, which is an annual leadership program for 9th grade students. The Youth Leadership program is a five week session in which students meet once a week to learn about community, government, business, and industry. These students learn issues related to quality of life here on the Gulf Coast. Some of the activities of the Youth Leadership Program include visits to the City Council and City Court, as well as learning from guest speakers who discuss issues on school administration, business ownership, industry, and other community related topics. (2) two $1 ,000 National Presidential Freedom Scholarships awarded to a Pass Christian student with half of the money provided by the Pass Christian Chamber of Commerce and matched by National Presidential Freedom. Each high school in the USA may certify two students to receive this $1000 scholarship. The students are recognized for performing outstanding service to their community. (1) one $1000 awarded to a Pass Christian high school student pursuing music, choral, or band. (1) one $500 to a senior student who lives in Pass Christian and is graduating from any public or private school.